The programming software and manuals can be downloaded from the Automation Direct website free of charge. 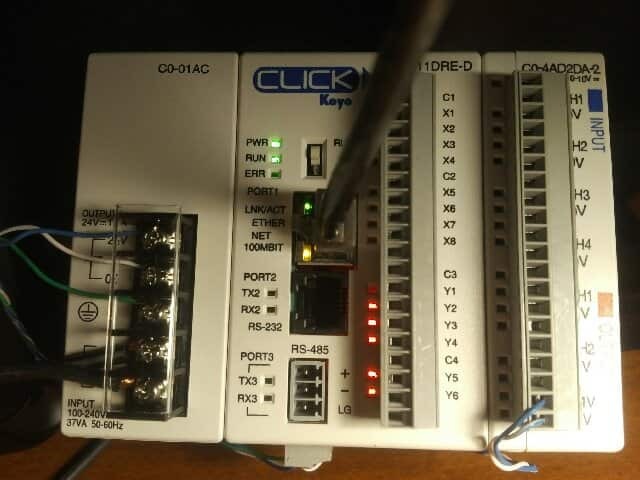 These are being used exclusively in our Click PLC series. 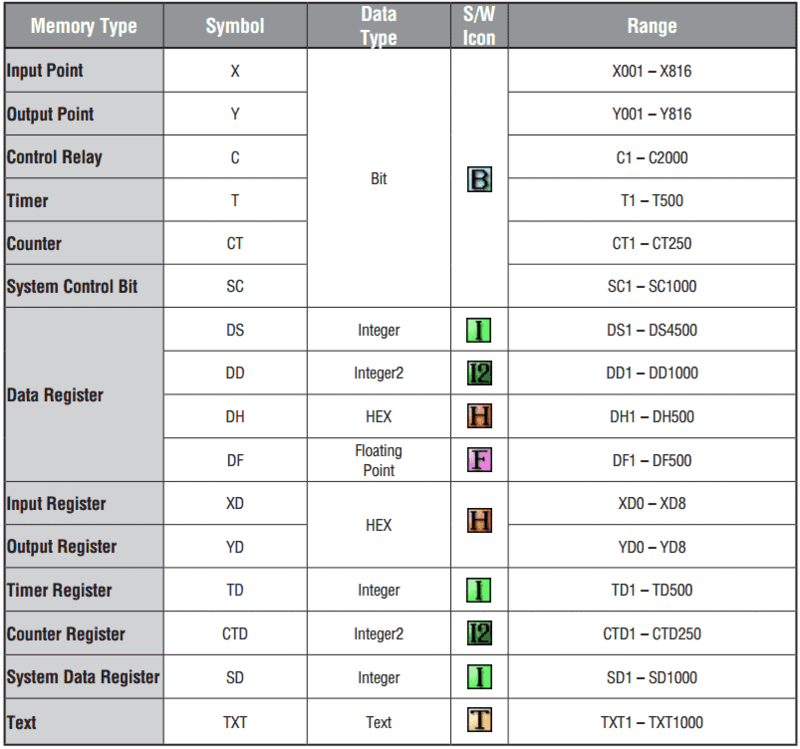 Click PLC data types can be found on the following table. 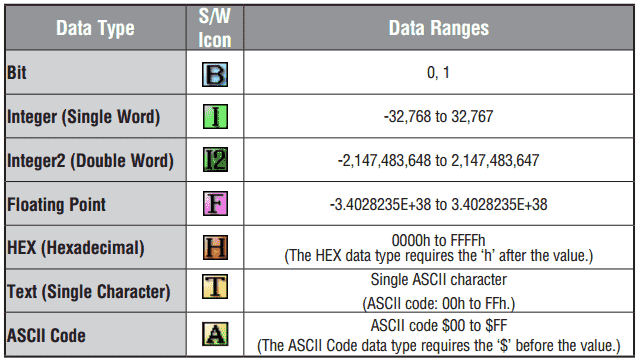 The different types supported are Bit, Integer (Single Word – 16 bits), Integer2 (Double Word – 32 bits), Floating Point (Single – 32 bits), Hexadecimal (16 bits), Text (Single ASCII Character – 8 bits) and ASCII Code (8 bits). 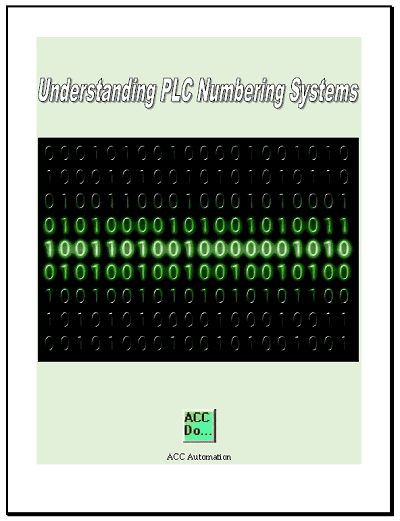 To better understand data types in the PLC you can get the free information guide by subscribing to this site at the end of this post. 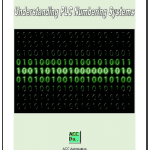 Once we know the Data Types that are in the PLC, we can look at the Memory Types. This is the Memory that the PLC utilizes within the program. 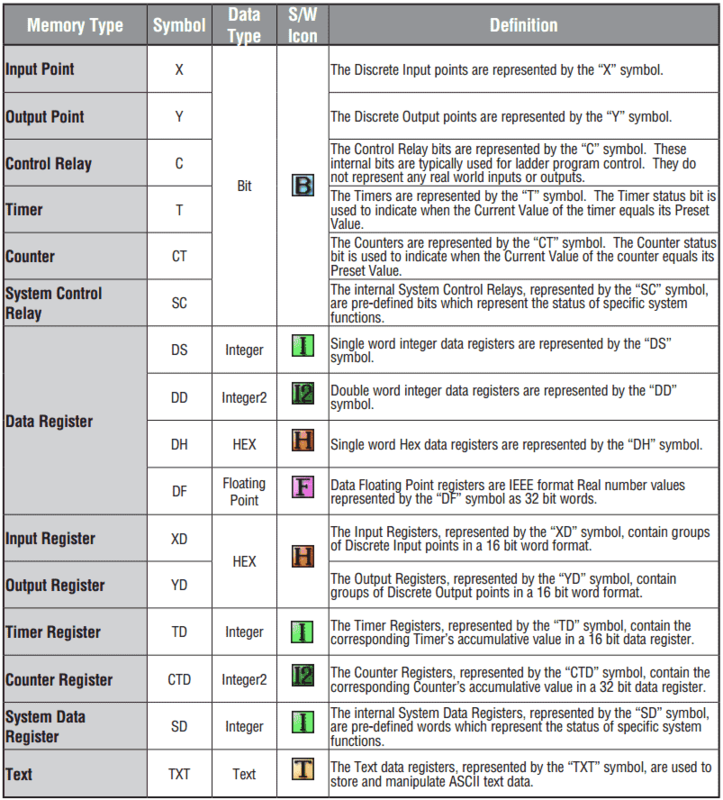 This includes where to look for the actual input and output points, timers, counters, data registers, etc. Indirect addressing is supported in the Click PLC. The manuals refer to this as ‘Pointer Addressing’. 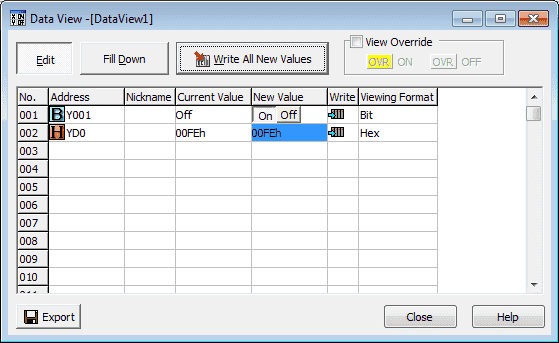 It will utilize the DS registers as the offset value and can be used with the DS, DD, DF, DH, XD, YD, TD, CTD and TXT data register memory types. DD[DS3] – This will point to the address in DD that DS3 value contains. If DS3 has a value of ‘145’ then the address will use DD145. As we change DS3 the corresponding address of DD will change as well. Now that we know the data types and memory types we can now look at the memory map. This will show us the amount of memory that we have in the PLC for addressing. 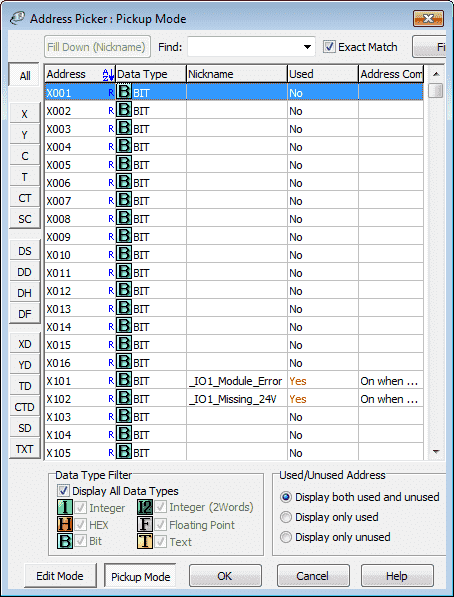 The following table shows the memory type and address range for each. 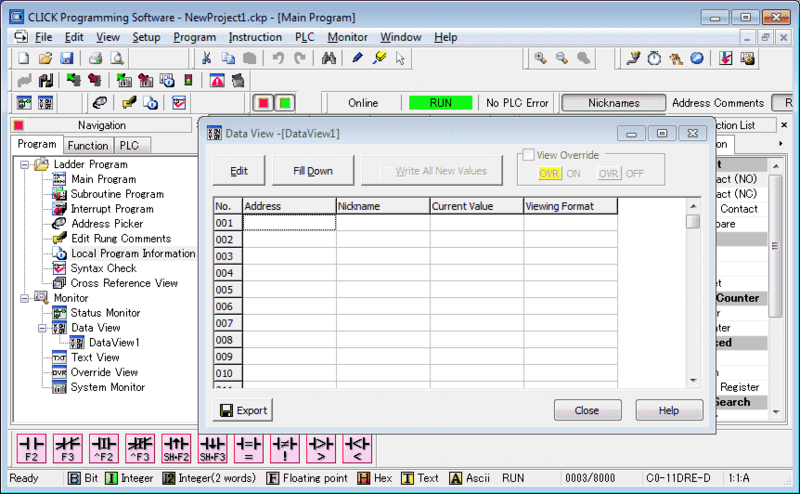 We will now connect to the PLC with the software and view how we address using the memory map above. You will note at the bottom of the programming software you get a reference to the different types of memory. This windows a great deal of information. We can call this window up offline to configure the PLC manually. This is ideal if we need to know the total current we need before purchasing a system. When online it will automatically read the configuration of our system. If you look under the CPU you will notice that our Input (X) are referenced X001 to X008 and our Outputs (Y) are referenced Y001 to Y006. The addresses for our analog card are also displayed. We have 4 inputs – DF1, DF2, DF3 and DF4. DF5 and DF6 are for our analog outputs. Bits X101 and X102 are used for the state of the analog card on our system. 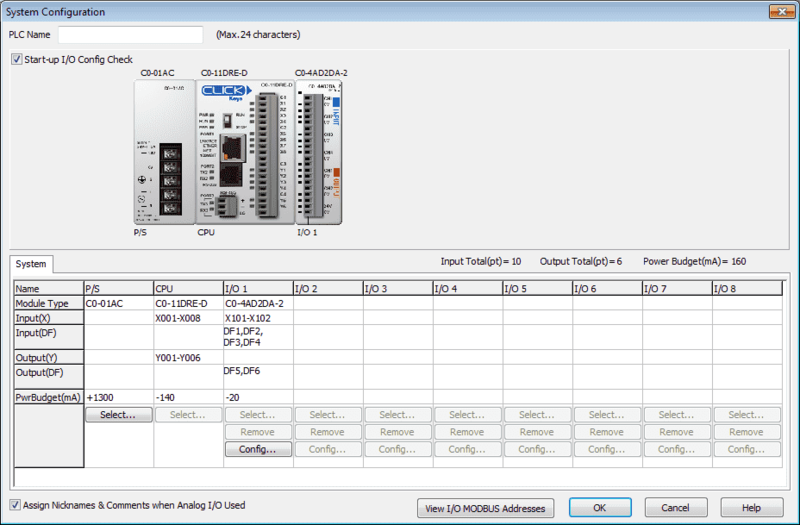 Note: I can scale the analog inputs and outputs by selecting the Config.. button in this window. No programming is necessary for scaling of analog. 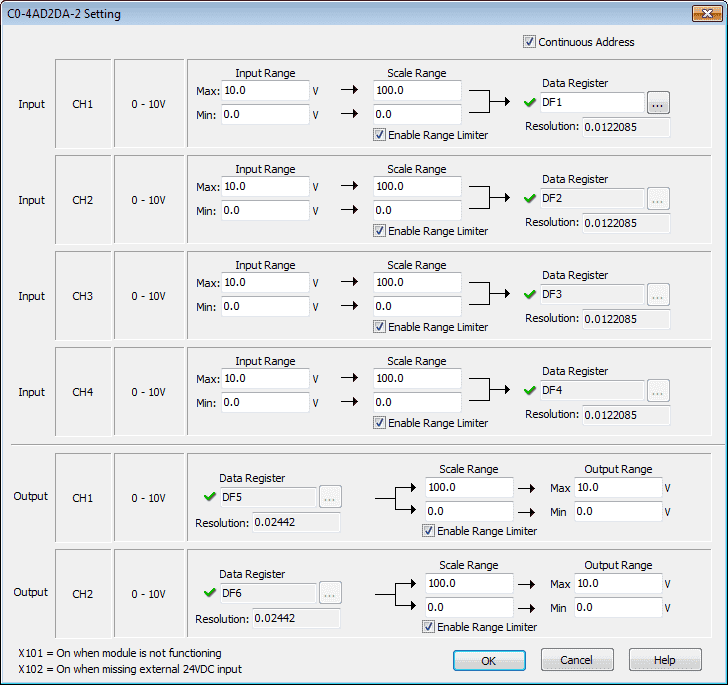 We select the analog range and set the corresponding scale range for both the inputs and outputs. You can name this Data View anything that you like. 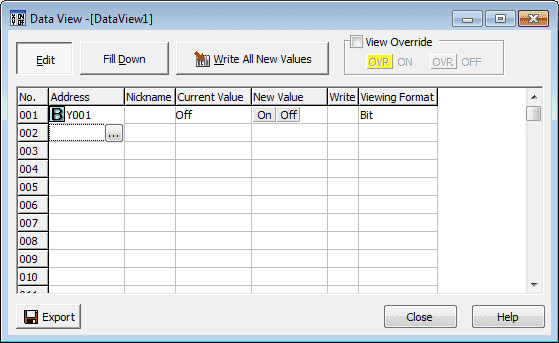 We will leave the default name of DataView1 and select OK. The Data View window will now appear on your screen. Select the Edit button so we can add an address. 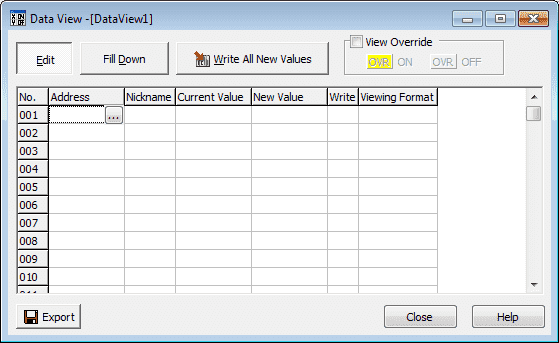 When the address is selected on the Data View window you will notice a box with […]. If we select this button the address picker is displayed. 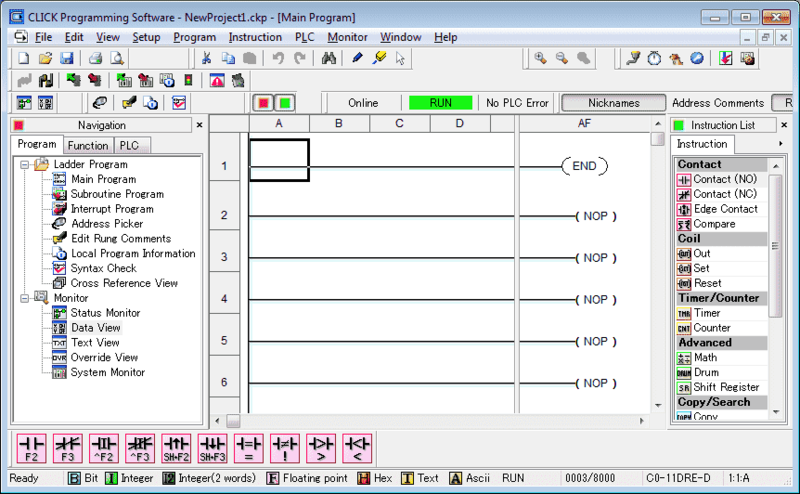 Select the first output address of our PLC. This would be Y001. We can select the ‘Y’ on the left side and then the first of the list. 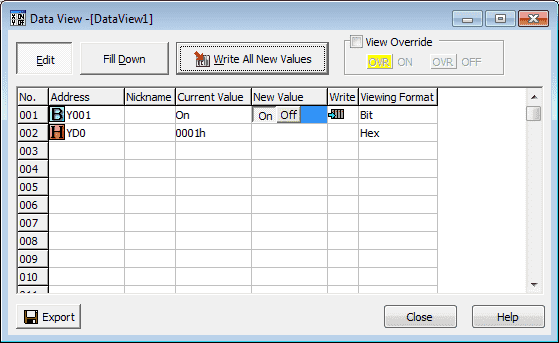 Now hit OK to bring it back to our Data View window. Under the New Value heading, select On for our address Y001. Select ‘Write All New Values’. You will get a message asking if you want to write all edits. Select Yes. The output bit on the CPU will not turn on. You will also notice that the bit 00 in the output word (YD0) also turns on because this is the same location. Lets write a new value of ‘FE’ into the register YDO. Select ‘Write All New Values’. Then when the warning message pops up select OK. The first bit now is currently off and the remaining bits in the PLC output channel are on. 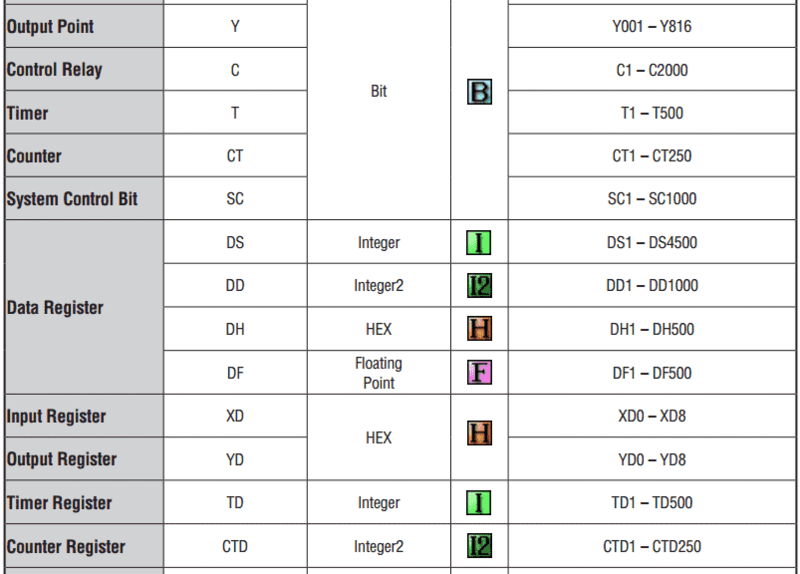 The Click PLC has all of the memory types available that are sometimes only obtained in larger systems. Addressing is very straight forward thanks to the system configuration window. Next time we will look at the Click PLC Timers and Counters.